The Olympic champion’s childhood coincided with WWII, years filled with hunger and fear. From a very young age, heavy labor became the norm of life for the “Bear Cub,” as his school pals came to call him. He was barely eight, yet he was already helping his father, who was a forest ranger: removing tree stumps, cutting down undergrowth so that healthy trees could grow better, splitting wood for the fire. Years later, on the wrestling mat, he more than once gave thanks to his father, who was strict but fair; he remembered his incredibly strong hands, which could grab on and never let go. The hard times taught him to keep going even when he was at the end of his strength, they enabled him to cultivate dexterity, stamina and the will to win. “It was because I developed that hunting instinct as a child that I became who I am, the Bear that feared no one, be it on the mat or in life,” he wrote in his memoirs. The reason Medved first took to wrestling was… the gypsies! One day, he saw them belt-wrestling, and he liked it. He was a feisty teenager, never backing down to anyone in street fights. He was quick to use his fists, yet honest and just at the same time. Aleksander Vasilyevich believes he inherited these qualities from his grandfather. When Aleksander was elected class monitor in the fifth grade, he not only established order in a class lacking discipline, he also set apart a smoke-free area on the school’s premises (he could not stand tobacco smoke). Medved got back to wrestling when he was drafted into the military. He immediately stood out in the tank regiment – he was the only conscript who did not have proper footwear. His “bear paws” would not fit in any boots, and he ended up wearing slippers for an entire month. It was also there, in the army, that he became known as a wrestler when he easily won a match with Ivan Kotsegub, the Minsk oblast wrestling champion. “That was when I came to fully realize that wrestling was my calling,” he writes. During his first USSR championship in 1957, Aleksander ended up in the top ten. This achievement had an invigorating effect on the young wrestler. He began training even more, with more intensity. The Olympic victory in Tokyo was well deserved, but not an easy one. The young athlete was not only forced to overcome his opponents, he had to overcome himself. He did not treat the match with Lennart Ericsson, a Swede, seriously, which almost cost him the medal. “I was heading to my first Olympic Games already everyone’s favorite,” he writes. “How could it be otherwise? Everyone was repeating the joke: ‘No human can overcome the Bear!’ Besides, I was winning one match after another. That must have played an evil trick on me. Not meeting a worthy opponent, I became so confident of my own superiority that I almost lost to Ericsson.” The Belarusian wrestler never forgot this lesson. From that moment on, he treated every opponent facing him on the mat with respect, no matter what his title. 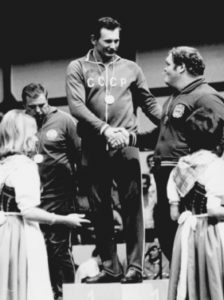 1972, Olympic Games in Munich: Aleksander Medved was then 35 years old. He went to these games thinking that it was time to retire from professional wrestling. As a true champion, he wanted to leave undefeated. During semi-finals, his opponent was the American athlete Chris Taylor, who weighed over 418lbs – almost 220lbs more than Medved. They had faced off three times prior to that. Aleksander Vasilyevich had studied his opponent well and had prepared for the match thoroughly. But the victory over the “elephant-like” American came at a great price: because of that match, Medved was diagnosed with injury- related radiculitis. And he still had ahead of him a final duel with the famous Bulgarian wrestler, Osman Duraliyev. Duraliyev also intended to retire from professional wrestling after the Olympic games and wanted to end his career with a flourish, by finally wrestling the gold medal out of Medved’s hands. But Medved was also fighting for the last time… When this match, unparalleled in its intensity, ended in a decisive victory for Aleksander Medved, the great athlete bowed to the audience that had admired his talent for so many years, then he stepped into the middle of the mat, dropped to his knees and kissed it… The entire audience stood up as one and unleashed an avalanche of applause upon the three-time Olympic champion. The life story of Medved the great wrestler is still being written. 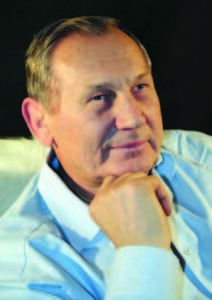 Aleksander Vasilyevich is a consulting coach for the Belarusian national wrestling team. The Minsk Olympic Reserve City Center bearing his name trains new champions. Boys come there who aspire to follow in the footsteps of their idol. Some of them will learn from personal experience what it costs to earn an Olympic medal.